SSC JE Paper I (Tier I) Result 2017 Declard - SSC JE Paper I Paper II Scorecard 2017 Merit List Cut off Marks at ssc.nic.in. SSC JE Paper I Result 2017 Scorecard Declared: The hottest news is that SSC JE Paper I Result has been uploaded on 06.06.2017 on ssc.nic.in. The qualified and shortlisted candidates list has been available with roll number, name and category of the candidates. The result can be checked in the image provided here. Those candidates who had waiting for SSC JE Paper I Result 2017 they can download their SSC JE Paper I Result 2017 from direct link given here. 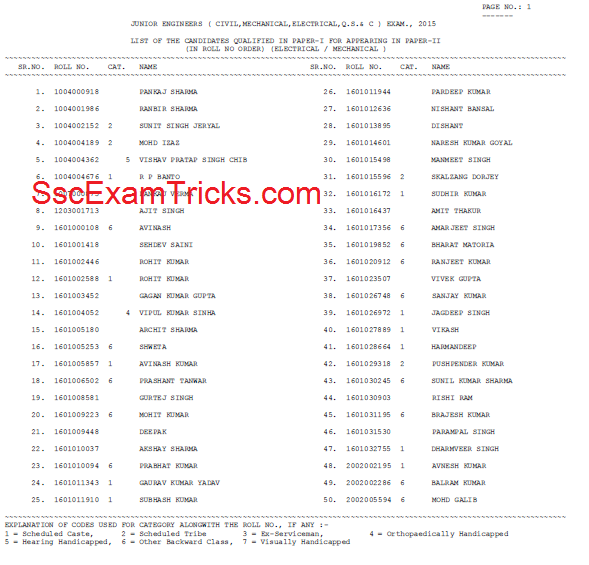 The marks obtained in SSC JE Paper I has been uploaded and can be downloaded by pressing on the direct link given in the end of the page. SSC JE Paper I Results declared are provisional and subject to the recommended candidates who fulfill all the eligibility conditions prescribed in the advertisement and also subject to thorough verification of their identity with reference to their photographs, signatures, handwritings, etc., on the application forms, admission certificates, etc. The candidature of SSC JE aspirants is liable to be cancelled by respective Regional Directors in case candidates are found not fulfilling the eligibility conditions or any other genuine reasons. 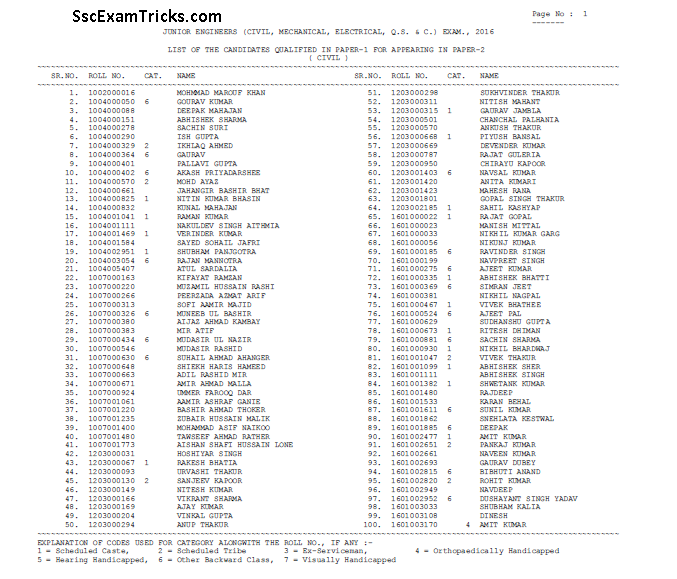 The SSC JE Paper-1 was an pen-paper based of objective sort of exam encompassing three parts; General Intelligence & Reasoning (50 marks), General Awareness (50 marks) and Part A General Engineering (Civil and Structures) or Part B (Electrical Engineering) or Part C (Mechanical Engineering) of (100 marks). The SSC JE Paper I was conducted in one session i.e. morning from 10:00 AM to 12:00 Noon. The SSC JE Paper I result has been declared and candidates are shortlisted for SSC JE Paper II which is a descriptive type exam of 2 hours in which Part A (Civil Engineering) or Part B (Electrical Engineering) or Part C (Mechanical Engineering) questions were provided for 300 marks. Candidates have to write answers by their own hand writing into answer sheet provided by the commission. The SSC JE Paper II Result 2017 has been announced 06th June 2017. The SSC JE Result has been available in PDF which can be downloaded either on official website address (mentioned above) and direct link given in the end of the page. 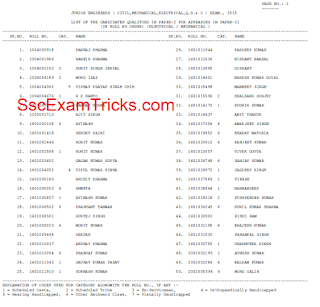 Click on that link and download SSC JE Result 2017 Paper I II Scorecard / marks. Open the PDF file in adobe reader and check your name and roll number in the list of qualified candidates for Paper II & Interview.